Get attractive discount from the first day of your vacation on. 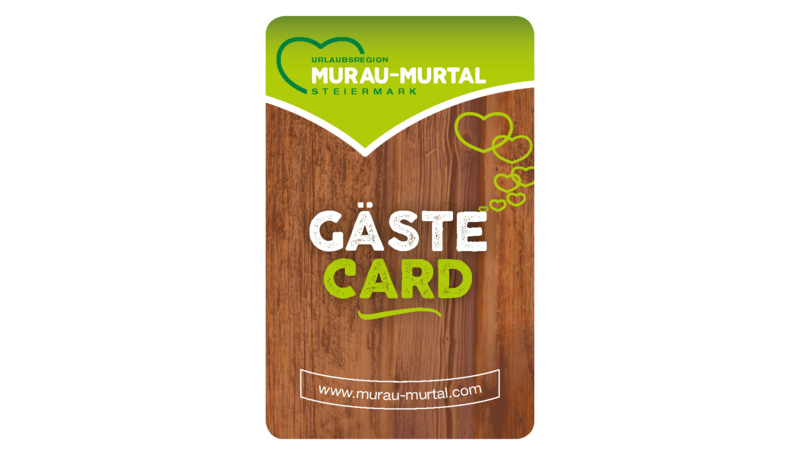 There is plenty to experience and discover with the “Murtal GuestCard”. The brewers city Murau is located directly on the banks of the river Mur, immersed in the beautiful landscape of the Mur valley. It is one of the most popular excursion destinations in the region and is also an ideal starting point for active hikes in idyllic mountain worlds. The JUFA Hotel is located only a few minutes walk from the town centre and yet offers rest and recreation during your holidays – at any time of the year. The Murtal-Spielberg holiday region is well-known, due to its numerous leisure options. Hiking, tobogganing on the summer toboggan track, cycling and climbing tours, swimming fun and, of course, skiing in the Murtal Ski Mountains. The most well-known are the Kreischberg – the venue of the Snowboard World Cup and the popular family ski region – and the ski resorts, Lachtal and Turracher Höhe. Apart from skiing, you can also test your skills on a sledge or bob. The family-friendly JUFA Hotel Murau*** in Murtal valley consists of 3 historical buildings and apart from the comfortably furnished rooms, it also offers its guests a modern sauna- and spa area. The natural deep relaxation method by heat keeps you fit for upcoming hiking and skiing tours! In the meantime, kids can let off steam in the hotel´s own mini-gym, face adventures in the wood-activity-climbing world, or wind down a little in the in-house cinema. By the way, you are welcome to bring along your four-legged friend – the facilities and staff are absolutely dog-friendly! If you feel like a swim or just want to have bathing fun: off to the open-air swimming pool or the Murau indoor swimming pool! Guests of the JUFA Hotel enjoy free access. Don´t miss an exciting visit to the Murau beer brewery. Subsequently, we recommend a stop at one of the many guest houses of the district – the regional cuisine is a treat to see and taste! The JUFA Hotel Murau*** is only a stone’s throw from the centre of Murau. It is a perfect base from which to embark on infinite adventures and can be reached easily by car. Guests can make use of the free parking spaces for cars and buses. There is a parking area for buses approximately 2 to 3 kilometres (10-15 minutes by foot) from the JUFA Hotel. Travelling from the north / south: Travelling on the A 10, take the “St. Michael im Lungau” exit – after you have passed through the toll, turn right towards St. Michael – turn left when you reach the other side of St. Michael towards Tamsweg – when you reach Mauterndorf, turn right before the underpass towards Tamsweg/Murau – continue straight on. After the sign for Murau – turn right at the first exit off the roundabout (Ranten junction), continue on Schwarzenbergstrasse towards “Hauptplatz – main square” (Schillerplatz), cross over the Hauptplatz, take the exit off the Hauptplatz and continue down Lichtensteinstrasse, turn left down Bahnhofstrasse, cross over the bridge, continue past the post office, turn into Friesacherstrasse – follow the tram tracks – follow the signs – continue straight on at “Friesacher Tor” and turn right after 100 metres into St. Leonhardplatz. Travelling from the east / south: Travelling from Judenburg or Neumarkt. In Scheifling turn off in the direction of Murau. When reaching St. Egidi, turn left at the first roundabout, follow the road towards the train station and then continue following the instructions detailed above. Murau Castle was first mentioned in historical documents in 1250. The original building used to be located south east of where the castle now stands. The Renaissance castle we see today was built during the 17th century, but it did not have its tower at this point. Among the many other points of interest, it is definitely worth visiting the chapel, the old kitchen and the Rittersaal (Knight’s Hall) with its tapestries. TIP: Special tours for children are offered on specific dates. Bathing fun is guaranteed for people of all ages in this 27,000 square metre pool. For our younger visitors, there is a children’s play area with a sand play area. A generous sized sunbathing area, leisure facilities, including a beach volleyball court, diving platform and other highlights are certain to enhance a summer’s day. Far from the hustle and bustle of daily life, you can enjoy the unspoiled natural landscape in a variety of ways during a visit to the tributary valleys of the Sölktäler Nature Reserve in the Dachstein-Tauern region. This nature reserve is the ideal spot to truly relax and contemplate fresh ideas. You will be able to escape from the madding crowd and the cable cars and take in the unspoiled natural beauty of the magnificent alpine pastures. A cinema experience for the whole family! Are you hoping to attend a sports activity week or a training camp? Do you want to really work up a sweat on your ski holiday or when you are tobogganing in the summer? The JUFA Hotel Murau*** has first-rate facilities. The sports hall is a particularly inviting place to get some exercise. There is also a wide range of activities on offer in the great outdoors during a sports holiday. Whether you choose to go cycling on the popular Murradweg cycling route, hiking and mountain biking in the Mur Valley mountain region or whether you opt for skiing or an exciting snowshoe hike in an enchanting winter landscape, the JUFA Hotel Murau*** guarantees that you will keep fit even on your family holiday. A strong team spirit and a positive working atmosphere cannot always be taken for granted. However, the ability to develop trusting working relationships can be learned. The JUFA Hotel Murau*** has the perfect facilities to suit your particular requirements, whether you are supervising a programme for school-aged children or running training activities for an association or a company. Students attending field trips can enjoy an engaging social experience and will learn a great deal about team spirit in the process. Staff attending company outings and training courses at the JUFA Hotel Murau*** will also find that their motivation levels, communication and team skills are enhanced. You will be able to make use of our on-site sports hall, a wooden adventure park and a modern cinema room, as well as take part in a whole host of activities in the great outdoors. There is also an indoor swimming pool a short walk away from the hotel. The many sightseeing locations that are within easy reach offer a range of fantastic experiences and the excellent facilities at our hotel ensure that school outings and trips organized for companies and associations are truly memorable. Looking for tips for group excursions? The many activities and destinations in close proximity to the JUFA Hotel Murau*** means you are spoiled for choice: The Murau WM-Hall, the Murau indoor and outdoor swimming pools, the Scheifling natural outdoor swimming pool, the Murau town museum, the Murau climbing park, hiking on the Frauenalpe mountain, Murau Castle, the steam train and so much more. "Sehr freundliches Team ! Bravo "
"Schönes Hotel mit guter Lage, gutem Personal ! " "Optimal für unsere Übernachtung am Murradweg." "Wunderschöner Kurzurlaub mit Enkerl !!!" "Gutes Hotel für den Ski-Urlaub"
The hotel manager Fabian Comes and his team are available to answer your questions at any time! Im interested in the offer "JUFA Hotel Murau***" in the .